PD Buzz is a small group of local Parkinson’s patients who have a common interest to serve the Orange County, CA Parkinson’s community. 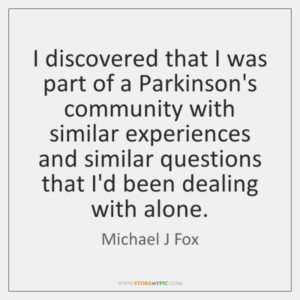 We believe that it is important to get connected with the local PD community as soon after diagnosis as possible. Whether you are newly diagnosed or have a well traveled path with the disease, we want you to know that you are not alone. There are many of us out there and we are better together. We are happy to share our experiences with you and help you find available resources. That said, please be aware that we are an independent group of people not sponsored in any way. We do not have affiliations with any other organization. We do not offer medical advice. As always, you should consult your own physician regarding any medical questions you may have.